TLDR Upfront: In light of the Paris attacks for those who want to (rightfully) avoid the fallacy of generalizations (1) in describing the attackers I recommend using the term “Salafist Takfiri” to *specifically* describe militant members of groups such as AQ, ISIS, AQAP, Boko Haram etc. who share a common set of behaviors and beliefs. These behaviors and beliefs are *not* the same as Muslims or even Islamists and understanding the difference is key to working together with our allies in this fight and isolating those who are our enemies. In 2006 the West Point Center for Combating Terrorism released it’s Atlas of Militant Ideology with a very handy segmentation (2) that I roughly reproduce below. Image not to scale. Were it to scale you would barely be able to make out Salafi as a pixel and Jihadi wouldn’t be visible. Those who believe in Islam are Muslims. Muslims who believe that Islam should be the basis of the state are Islamists. Suuni Islamists who believe the Islamic state should be built off of 14th Century principles or the restoration of the Caliphate are Salafists. Takfiri are largely our problem. There are Shia bad actors as well. The Shia version of Islamist is a Khomeinist (those who believe Islamic clergy & jurists should run the state on Islamic principles). The Shia don’t really have a version of Salafist/Whabbiest – but their version of Takfiri are groups like Hezbollah, the Al-Sadr Brigades and Shia death squads in Iraq. I don’t expect everyone to know this. The “mafia” that kills Muslims for drawing pictures, those are the Salafist Takfiris. They are *not* Muslims in the broader sense. And to every commentator who gets on a TV show or a radio or a news site and claims that because they have “read the Koran” and suddenly thinks they are an expert on militants or fundamentalists or even Muslims.The book is meaningless in this conversation. Salifist-Takfiri are prolific writers and readers, and they don’t cite the Koran, they cite *scholars* of the Koran. Not unlike politicans today are likely to cite founding father and courts are likely to cite court cases. Indeed trying to understand what’s going on in modern Islamic militant fundamentalism by only reading the Koran book is like trying to understand the history of US politics in the 20th Century by only reading the magna carta. Back to the subject at hand – the Whabbist faction of Salafism is indeed named for the scholar Muhammad ibn Abd al-Wahhab (18th century) and Salafism itself is named for the Islamic scholar & cleric Ibn Taymiyyah (14th Century). If folks wish to inform themselves better on this subject I urge to read the executive summary (26 pages) of the Atlas. Its a quick read and not too dense, and a far better source than Bill Maher or commentators who have zero expertise in the subject. If you want to go “deep”, the attached Research Compendium, clocking in at over 300 pages, provides a great guide to the scholars, and the nuances of the ideology that form these splits. (1) Every *legitimate* problem solving method in the world seeks to reduce the scope of the problem by separating wheat from chaff, signal from noise. Almost every form of analysis is an attempt to isolate further, what is the root cause activity that is driving the negative behavior. Because once you find that smallest part…you can focus on it, put all your attention into that part and not defuse any effort by spreading it thin on the uninvolved. It’s a form of logic – given group A and group B, and group B is the root cause of behavior C – no matter how much effort you spend working to modify group A, you will not change group B and therefore not improve behavior C.
Everything bad you could say about Salafist-Takfiri I would accept and add a few more. This very small subset of all Muslims is punching far above its weight and are a true manifestation of evil on this planet. So why waste our time and resources on the other 1.49B Muslims who *aren’t* Salafist Takfiri? This is not about political correctness, this is about utility in target selection. (2) I call this fractal segmentation and it’s based off of statistical self similarity of fractional units, or more easily called “the coastline of britain problem”. Stated simply as you increase the fidelity of your measure, and are able to read in ever smaller units of measurement, the figure you are studying literally changes in its shape,dimensions and measurement. The thought experiment which demonstrates this is if you imagine measuring the Coastline of Britain with a 200km stick, it will be one shape and have a distance of 2400km. But if you measure the Coastline of Britain with a 50km stick, it will have a very different shape, and a coastline distance of 3400km. In professional (private sector) analytics, the segmentation goes down to micro clusters of 10,000 people and in some cases gets down to the “protocol of one”, measuring a problem a single individual at a time. This is fairly new because the computing and instrumentation power to do this simply wasn’t available in the past. 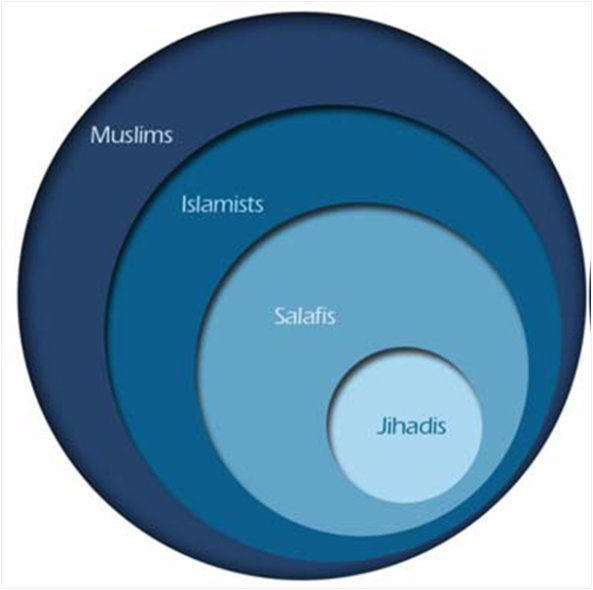 (3) The term Takfiri does not appear in the West Point CTC Atlas of Militant Ideology. It actually was popularly coined (in this usage AFAIK) by David Kilcullen in his book Accidental Guerilla published in 2009. Takfiri is a great moniker because it is theologically more accurate than Jihadi (which can mean many things and is at times a venerated term) to describe Muslims who, outside the law, take it upon themselves to kill other Muslisms. It has the added side benefit of being a grevious insult. ISIS has been known to cut off the tongues of anyone they hear mutter Takfiri in the towns. They want to be Jihadi’s, they want to claim that legitimacy, but they are really Takfiri. Tenet 1: They specifically recognized the validity of all 8 Mathhabs (legal schools) of Sunni, Shi’a and Ibadhi Islam; of traditional Islamic Theology (Ash’arism); of Islamic Mysticism (Sufism), and of true Salafi thought, and came to a precise definition of who is a Muslim. Tenet 2: Based upon this definition they forbade takfir (declarations of apostasy) between Muslims. Tenet 3: Based upon the Mathahib they set forth the subjective and objective preconditions for the issuing of fatwas, thereby exposing ignorant and illegitimate edicts in the name of Islam.